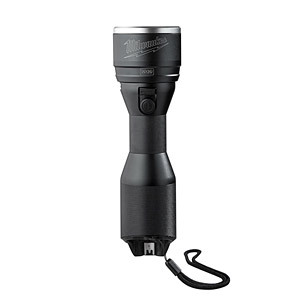 12 volt cordless, LED High Performance Flashlight. Body Only - no batteries or charger supplied. Sliding head allows adjustment of beam pattern from flooding to spotting. Milwaukee designed optic maximises performance, powerful LED can cast 350 m intense and highly focused beam of light with up to 800 Lumens. Machined 6000 series aluminium with a type II anodized finish body, highly durable and impact resistant polycarbonate lens for extreme durability. Ergonomic contoured grip with knurled texture ensures perfect handle. IP54 rating, light is protected from dust and splashing water. Compatible with the full range of Milwaukee Red Lithium-Ion 12 volt batteries and chargers.